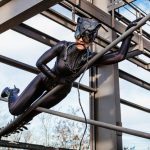 Another two catwoman cosplays for you! One catwoman-comic look (it’s around 10 years old -(1)), and a unique approach on the cat (2). Good suit with nice… views. But I don’t like the goggles.